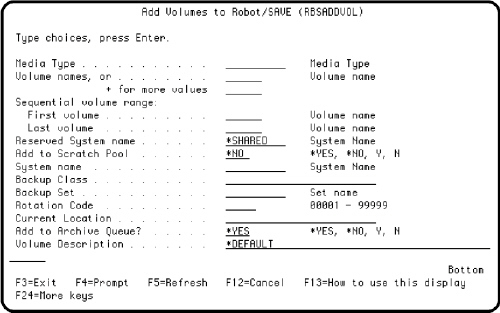 Populate the inventory of volumes in Robot Save with scratch volumes, or add tapes to established backup sets. Set up a list of historical volumes to be read into Robot Save object archive records later using the RBSADDALL command. Make sure the Add to Archive Queue parameter on the RBSADDVOL command has been set to *YES. Install Robot Save on your IBM i (OS/400, i5/OS) running on IBM Power Systems (System i, iSeries, AS400) . Set up Robot Save backup classes, sets, and rotations. Add the libraries RBSDTALIB and RBSPGMLIB to your library list. Press F4 to display the command prompt. Complete the command parameters with the information for your system. If you need additional information about the command parameters, press the Help key to display the command help. Make sure you enter the volumes in the sequence they were used, for historical backup records. Make sure the Add to Archive Queue parameter on the RBSADDVOL command is set to *YES. The list of volumes will be read into a file called RBSAT in RBSPGMLIB. You can add as many historical backups as you wish. The actual processing of the volumes will take place when you execute the RBSADDALL command. We recommend that you submit the command to batch as it can run for an extended length of time (each tape will be displayed as it processes). If you are using an AML (automated tape librarian), the tapes will be loaded automatically. Otherwise, load the magazine with the tapes in the correct order. You will be prompted when more volumes are needed. The RBSADDALL process can be canceled and restarted, if necessary. After the command has completed, the volume and archive information is available to Robot Save. The volumes then can be recycled into the scratch pool as they expire.